You know how we're an art family...: WIP Wednesday & a giveaway!! Several months ago, I decided to make my kids each an article of warm clothing for Martinmas, in the spirit of St. Martin sharing his cloak with the beggar. (I can't claim originality on this idea. I fell in love with Grace's Martinmas knits last year.) I've been working on felted slippers for the boys for a while and those are all finished and ready for Martinmas. Elizabeth's Martinmas knit began it's journey with me back in July while I was in my bread making class. I'd finish a panel, then work on something else for a while. Eventually, I ran out of yarn and needed an extra skein of the begonia pink. Finally, a little over a week ago, Elizabeth's sweater seams were sewn and her buttons attached...but I just couldn't wait until Martinmas to try it on her! So you get an early preview...and I have to come up with a quick-y Martinmas knit for Elizabeth! First, I just have to show you these gorgeous Indonesian-made buttons that I found on etsy. I love the delicate and simple flower design, and the fact they matched the brown trim on Elizabeth's sweater just perfectly! 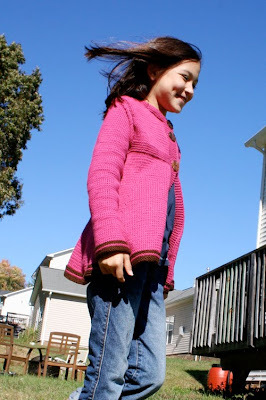 Overall, I think the "Libby" was a perfect fit for Elizabeth (almost 10) with great sleeve and sweater length. 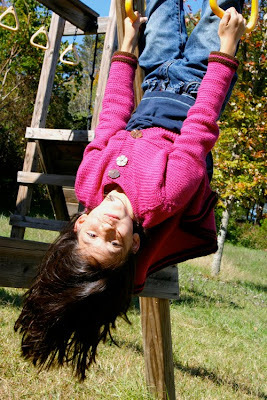 A sweater you can hang upside down in, now that's a cozy knit! Over the last couple of weeks, I've been playing around with a few autumnal patterns that I found online, and you get to benefit from it! 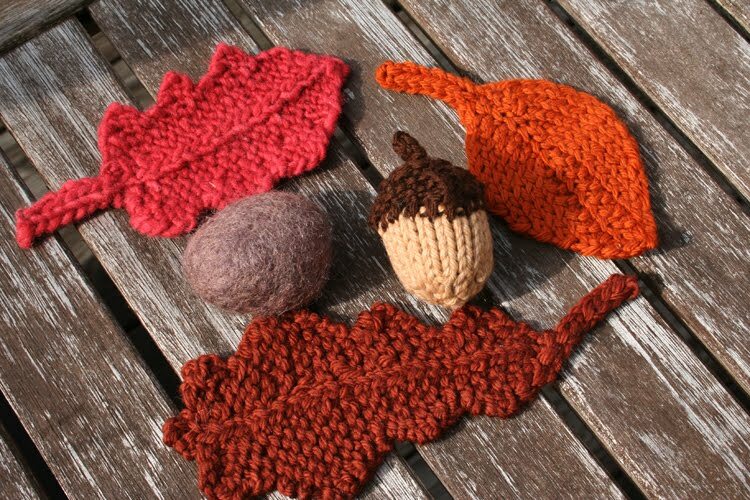 This giveaway includes 3 knitted leaves, a knitted, stuffed acorn, and a felted rock. All of the items are from scrap yarn (all cotton and wool) and stuffed or felted with wool. You might choose to decorate your nature table, cozy up a nook on your porch, or use them for an autumnal table centerpiece. All you have to do to win is leave a comment on this post. To earn an extra entry you can become a new follower or blog/tweet/Facebook about this giveaway (just be sure to leave me another comment with a link, if appropriate). I'll draw a winner on Monday, Nov 1, at noon. International entries welcome! the sweater is stunning joy! what warmth a love elizabeth is surrounded by! the giveaway is amazing, it would be incredible to win!! Elizabeth's sweater is GORGEOUS! And what a fun giveaway, those leaves and the acorn are precious. Thanks Joy! 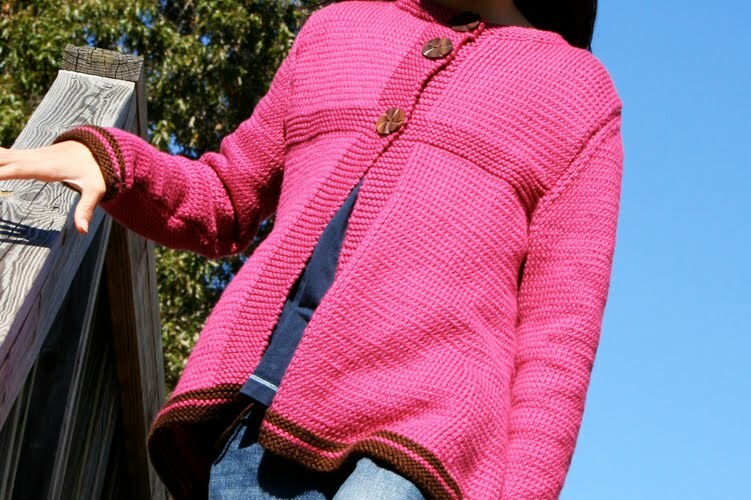 Elizabeth's sweater is absolutely beautiful, and the buttons you picked out are a perfect addition. I love your giveaway items too -- they are precious!! The sweater is beautiful and I love your little autumn knits! Wow Joy, the sweater is amazing. It would be a joy to win your knit autumn creations. Joy, the sweater is so special, and I am amazed at your wonderful handiwork! 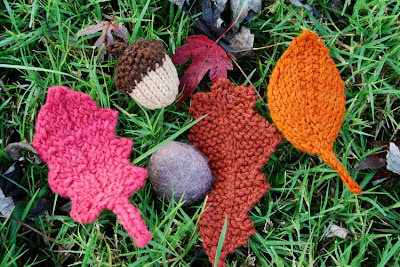 I think your autumn knits would look great next to my basket of pine cones from Finn! You did such a great job on that sweater! Elizabeth looks great in it. Gosh, you are SO clever! 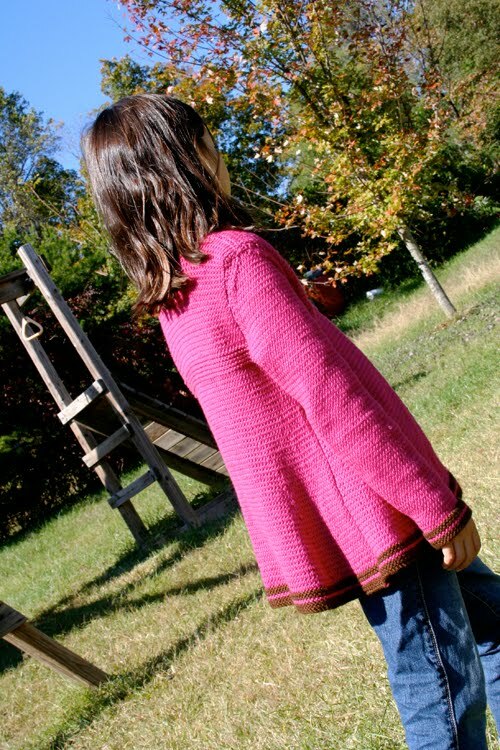 I love the sweater and what a lovely little giveaway! Oh I just love these! such a cute idea! Happy fall! love the acorns and leaves! That is an incredible knitted sweater! Oh my goodness, it just looks so wonderful. I love Michaelmas, and creating something special like this makes the day even better. Joy, these are adorable! And I love that sweater! It looks great on Elizabeth! Great job! I just love that sweater. You did such a beautiful job. The buttons are perfect. wow! the sweater is gorgeous! Oh how lovely they are! I hope I win! These would be a sweet centerpiece for our table. And your sweater for Elizabeth is magnificent! Great job! Those are so precious-- if I win I'm going to felt a little squirrel to play with them! I just love the leaves! I found your blog via The Magic Onions and I love it, bookmarked! Thanks for the giveaway. That sweater is gorgeous! I love how it has a bit of a twirl to it, and the buttons! Pick me. I love your sweater. I love all things knitted right now. I want to knit cute stuff like yours. I love the fall leaves. I want to join you on revelry...I just have not been able to play over there very much. I tried felting rocks the other day..thanks to you and Ginny. Let's just say I need some more instructions. I would love to have a knitting giveaway one day. You are awesome. Oh what a beautiful sweater! And I love the buttons. Your autumn treasures are just lovely. What a fabulous giveway. Adorable and perfect! I love them. the details on the sweater are amazing. Wow, your work is beautiful! 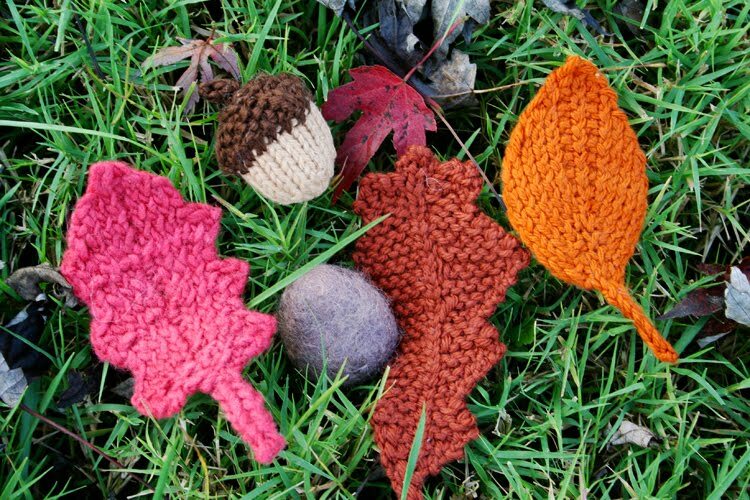 I love the knitted leaves!! I would love love love to win this!!! I have had that leaf pattern open all week and have been wanting to make them! Great giveaway! I want that sweater! Love it. Love the leaves and acorn giveway - count me in. The sweater looks fantastic, Joy! I remember you were at the very beginning when we met at the RSI. It looks gorgeous on Elizabeth. 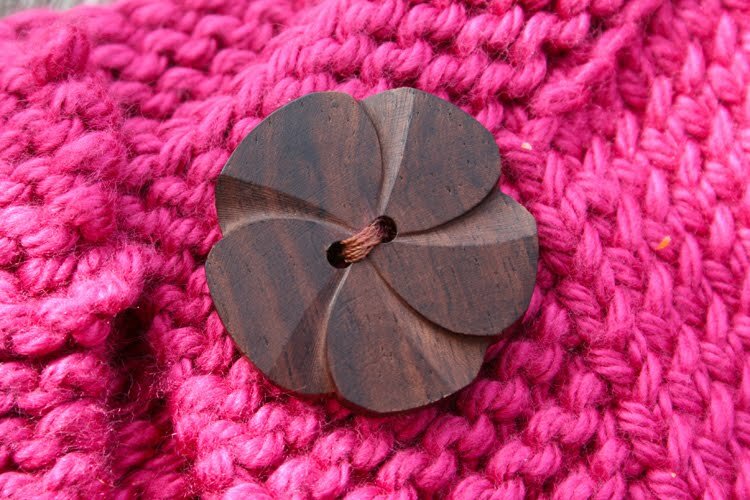 I love the colour combination and how the beautiful dark wood button matches the brown. 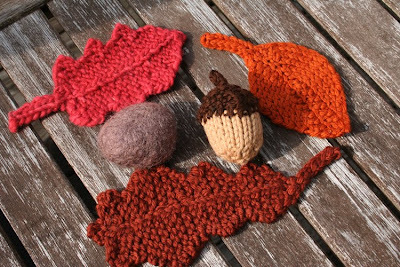 Your knitted leaves and acorn are so cute and would look great on our nature table. Count me in! Oh cute! I love the sweater that you made for Elizabeth. Your giveaway is very generous...I would love to be entered. I love the cardigan you knitted for Elisabeth and can relate to your not being able to wait to give it to her when you finished it (Im so bad at keeping presents secret:)Id love to win your autum goodies! Beautiful sweater , just beautiful! I just started the Einstein Coat by Sally Mellivlle which reminds me of this one. But I am definitely going to make this one! And those buttons--lovely! We celebrate Martimas too with lanterns and we buy a coat for a needy child, its been a looked forward to tradition in our home. 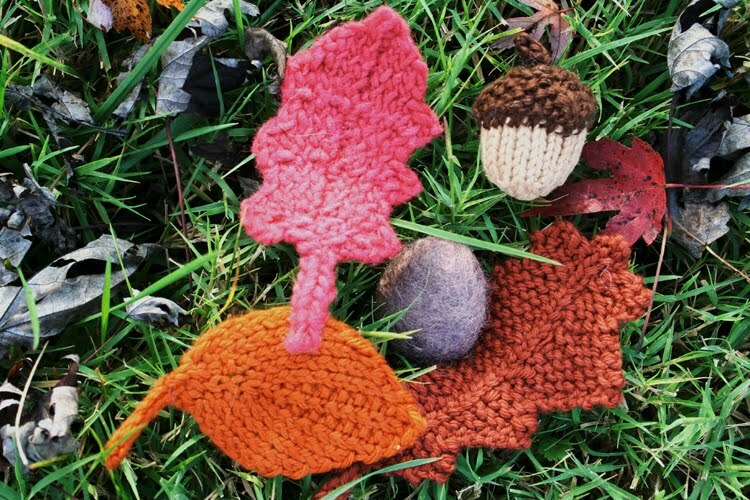 Oh, these little fall knits are too cute. And that sweater is gorgeous! Those buttons are really special! These are the cutest things EVER. I wish I could do more than crochet a scarf! Remember me? I've been quiet in the blogging world. I hope you and your family are keeping well. I'm always amazed at all the knitting you accomplish! Elizabeth's sweater is beautiful. What a generous giveaway. I missed this entry ;(.